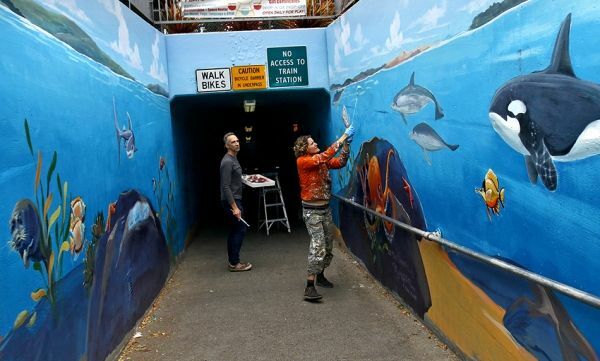 Artist Morgan Bricca has been restoring the faded, damaged “Year of the Ocean” mural located on the California Avenue pedestrian underpass, giving the undersea-themed artwork some much-needed touchups. Check out the before-and-after photos to see her work. Muralist Morgan Bricca adds details to the “Year Of The Ocean” mural originally designed by artist Oscar Castillo at the California Avenue Caltrain underpass with fellow muralist Bill Plumb assisting on May 16, 2017. The mural, which has suffered peeling, fading and much deterioration over the past 19 years, has now been restored. 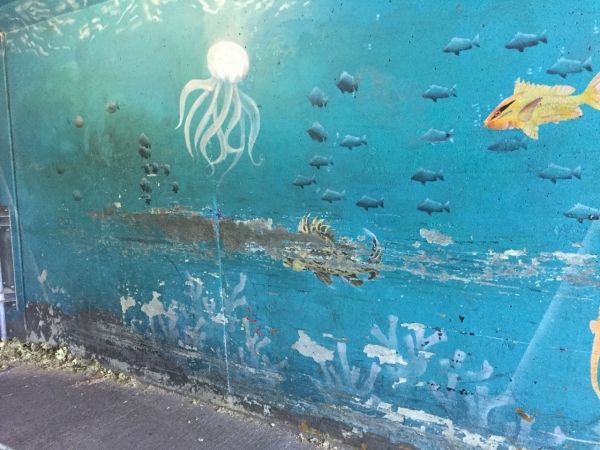 Before: “The Year of the Ocean” mural in the California Avenue pedestrian underpass became damaged and faded over the past 19 years.